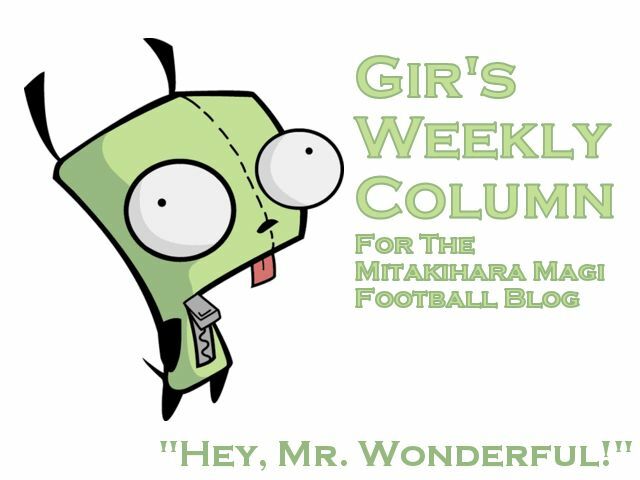 Hello everyone, readers on the Magi Football Blog and the Daily Magi. I am Gir Todafunk, Mr. Wonderful, back with another weekly column for all of you to enjoy then gripe on. Only one tackle for me last week against Miami. I was quiet as a mouse last Saturday in the rain. I couldn't say the same about Ryan Hodge. That guy was a monster, with four sacks. What a warrior. All in all, a no-nonsense 77-0 shutout of Miami. They have hurricanes, but we have typhoons. And El Nino and La Nina. Because Pacific storms systems. Anyway, with that settled, I want to disclose my top 10 restaurants in nearby Victoria. I owed you folks my Top 10 because I went on a tangent with my discussion of quarterbacks, so here we go. Features amazing French cuisine with food that is meant to be savoured, not rushed. Great professional service and bistro atmosphere. Cozy, romantic ambiance matched with innovative cuisine combine to produce a truly memorable evening. Great place for a date or special occasion. I ate here in the offseason with Nana, awesome place. Stunning waterfront views, exceptional French cuisine and outstanding wine selection. Canada is just known for delivering in terms of French cuisine. It's part of us, you know. Featuring Northern Italian cuisine, great atmosphere and an internationally acclaimed wine list. Best Italian restaurant in the city. Definitely the best quality pub food in Victoria! Classy pub atmosphere, live Celtic music 7 nights a week, as well as one of the biggest selection of draft beers in Victoria. They also have TV screens to watch us in action. An official Men About Town pub. Excellent seafood, wonderful service and equally great atmosphere. Think Ika's meets Wolfgang Puck. One of the very best places for fresh, healthy and great tasting food in Victoria. Situated in the heart of downtown Victoria, Rebar is an extremely popular spot with both locals and tourists. This is a popular hangout with Mitakihara students, and there is a Rebar located in Madoka Square. Exciting vibe and atmosphere make this Spanish-influenced restaurant one really happenin’ place. The best tapas are here. Can't find them anywhere else on the island. Ulla Restaurant offers something for everyone, from lighter seafood dishes to hearty and flavourful meats to exciting vegetarian dishes. This is a proving ground for a number of Mitakihara culinary arts students who have apprenticeships here. With accolades including best Casual Italian Restaurant BC, Best Vancouver Island Restaurant and Victoria Chef of the Year, Zambri’s also features an excellent Italian wine menu. This is also another restaurant staffed by former Mitakihara graduates and is used by culinary arts students to test their skills. So there you have it. My top 10 places to eat in Victoria. This week, we face Notre Dame. I'll tell you all what happened in the next column. I'm Gir, signing off till then. You are not alone.